America used to have allies in this world: England, Canada, France, the NATO Alliance, and the rest. We went through WWII together. We were united as common democracies. Now America has turned its back on our long-time friends, and has reached out to our new pals – the Gangster dictatorships: Putin’s Russia, Dudirty’s Philippines, and North Korea. We no longer have any trade partners. Trump disbanded the TPP, giving all of Asia to China. We are in a Tariff war with our former closest allies, Canada, the EU, the UK, and Mexico. 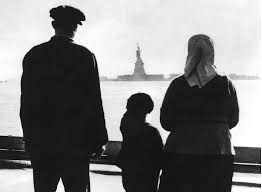 We, a nation of immigrants, have closed our borders to those seeking asylum from violence and political turmoil. America has made a mockery of its constitution. Trump has done exactly what he promised his hateful, racist followers, during his campaign. He has destroyed the structure and integrity of the American government. The occupant of the White House is no longer the leader of the free world. He is, instead, an opportunistic, self-serving, self-promoting greed monger, hell bent on filling his pockets with every penny he can pilfer from America’s coffers. And his poll numbers are going up. America likes him. America’s once-shining star is a tarnished shard of the nation that gave hope to so many. At long last, breathing free. This entry was posted on June 20, 2018 by shauncostello. It was filed under Fiction and non-fiction from Shaun Costello, Uncategorized and was tagged with America, Breathing Free, Donald Trump, Immigrants, Immigration, The Hope of America, The Statue of Liberty, The Wretched Refuse, Trump's America. Don’t know if it’s more sad or repulsive. Anything less than a blue wave in November will leave me ashamed to be living in this country. I feel the same way, Jeff. If I could afford it, I’d leave in a heartbeat. Denmark or New Zealand seem like heaven right now. America will not recover from this in my life time. The judicial appointments, all extreme right wingers, are life time jobs. America’s fucked. And Trump’s numbers are rising. Madness.